Fairmount Park in Philadelphia is unique in the story of American planning. It represents one of the first efforts to protect a municipal watershed by dramatically altering land uses to both mitigate pollution and create a space for public recreation. 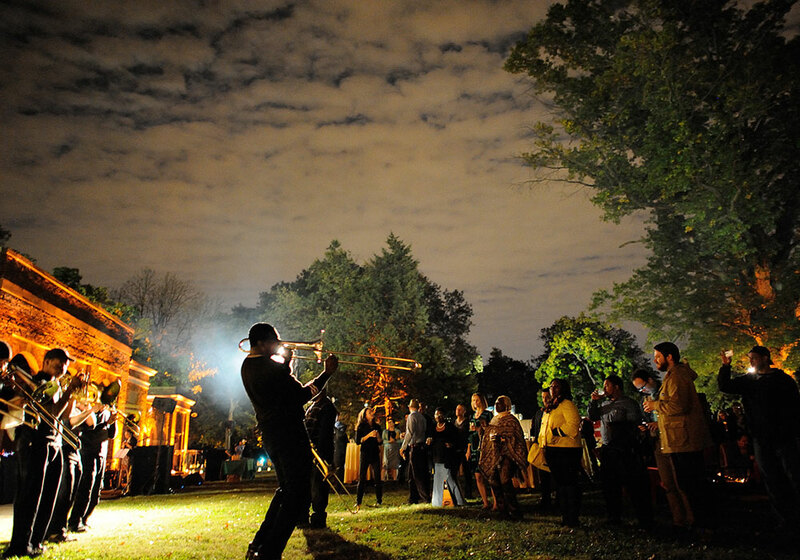 Musicians entertaining the crowd at the 2014 GLOW in the Park, held that year outside the Strawberry Mansion Music Pavilion in East Fairmount Park. Photo by Albert Yee. Fairmount Park’s 2,000-plus acres are divided into East and West Fairmount Park by the Schuylkill River. Runners at the start of the annual Boxers’ Trail 5k in East Fairmount Park. They're following the same path where heavyweight champion Joe Frazier trained. Photo by Albert Yee. With its innovative Fairmount Water Works, Philadelphia began drawing its drinking water from the Schuylkill River in 1815. By the mid-19th century, however, industrial pollution had severely degraded the water's quality. Gradually, city leaders began noting the effects of upstream industrial land uses on its principal waterway as the concept of the interconnected watershed gained popularity in the 1860s. Nativist unrest in 1840s Philadelphia had prompted civic leaders to look at providing open spaces as social safety valves. Spurred by public health and safety objectives and caught up in the 19th century desire to build public parks with spillover economic benefits, city officials began acquiring land north of the Water Works. Between 1812 and 1868, the city purchased or condemned estates, advancing nearly up to the mouth of a major tributary, the Wissahickon Creek. This land assembly represented a bold expression of municipal push for public health and transformed an industrial corridor into a bucolic valley dotted with an array of 18th and early 19th century structures. Shortly after the park’s full assemblage, civic boosters convinced the federal government that West Fairmount Park would serve as an ideal location for the Centennial International Exhibition of 1876. By its closing in November 1876, the Centennial had drawn more than 10 million visitors to view the promise of a technological future coexisting with a rural, natural setting. No single landscape architect can claim credit for the design of the park. Its assembly around watershed health, its service to the Centennial’s technological paradise, and its conscious creation of an idealized 18th century rural landscape makes it unique in America. Today, Fairmount Park spans 2,054 acres and contains a number of historic properties, built structures, and works of public art. Still standing are the houses whose estates along the Schuylkill initially formed the park. Many of the homes are open to the public, offering historical interpretations into lives of prominent Philadelphians of the past and renowned collections of period furnishings and art. The Centennial Exhibition, designed in large part by Herman J. Schwarzmann, left behind a number of structures including Memorial Hall, now housing the Please Touch Museum; Centennial Arboretum; the Catholic Total Abstinence Fountain; Ohio House, previously leased to a local restaurateur; and man-made Centennial Lake. Fairmount Park also contains an orchard and greenhouses; multiple playgrounds, including the first for children of all abilities to be sponsored by a municipality; numerous facilities for baseball, soccer, basketball, and disc golf; trails for hikers, bikers, runners, and equestrian riders; and landscape ranging from forested areas and grassy meadows to paved walkways and trails. The most recent plan for the park, the New Fairmount Park Plan, was drafted following a series of public meetings, surveys, and interviews where citizens and residents of the surrounding neighborhoods gave their input about improvements and new features. 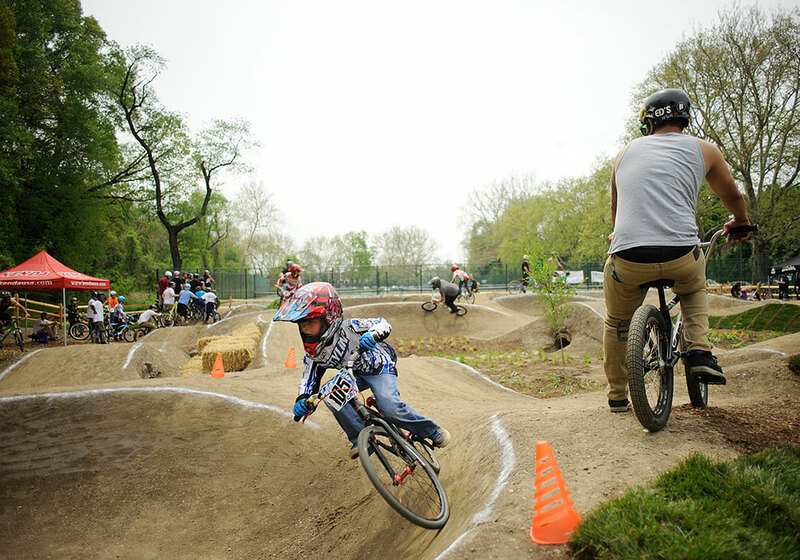 Bicyclists at the opening day of the Philly Pumptrack at Parkside Evans, dedicated in 2014. Photo by Albert Yee. The South Garden of the Water Works, created between 1829 and 1835, was one of the earliest formalized public gardens. After undergoing years of renovations, this National Historic Landmark’s pavilions, paths, statuary, azalea garden, and fountain attract visitors once again. The pathways and bikeways in the park stretch on both sides of the river and across the park from east to west. Recent or upcoming work to improve trail connections and signage can be seen in the cross country trails of Belmont Plateau, the multi-use “Trolley Trail” of East Fairmount Park, and the Randolph Creek connector trail from Mander Playground across Kelly Drive to the Schuylkill River. Many tributaries to the Schuylkill River pass through the park — including Randolph, Wissahickon, Chamounix, and Greenland Creeks — and provide interesting geographic and topographical features in the park and its many trails. They create opportunities for nature education and wildlife observation, and allow additional possibilities for native plant restoration and plantings that assist with stormwater retention. Planners in East Fairmount Park are transforming an abandoned reservoir into the Discovery Center, a partnership between the National Audubon Society and the Philadelphia Outward Bound School, to reactivate an abandoned water reservoir for environmental education and adventure programming. The site will continue to serve as an important wildlife sanctuary for migrating birds. Philadelphia Parks and Recreation’s Urban Forestry group is working to expand the tree canopy according to the 2010 GreenPlan Philadelphia and also protects the park’s forested areas from climate change, invasive plant species, and insect-borne diseases. Additional resources are focused on maintaining the park’s meadows, wetlands, riparian areas, and watershed parks to allow human activity while protecting native plants and wildlife. The Schuylkill Navy, an association of amateur rowing clubs that regulates competitions on the river, began in 1858 and operates to this day. Rowing clubs built structures along the Eastern shore of the river, nicknamed "Boathouse Row." The Row's restored lights provide one of Philadelphia’s most iconic nighttime views. In 1876, Fairmount Park hosted the Centennial International Exposition, which created some of the many buildings and structures now preserved in the park. 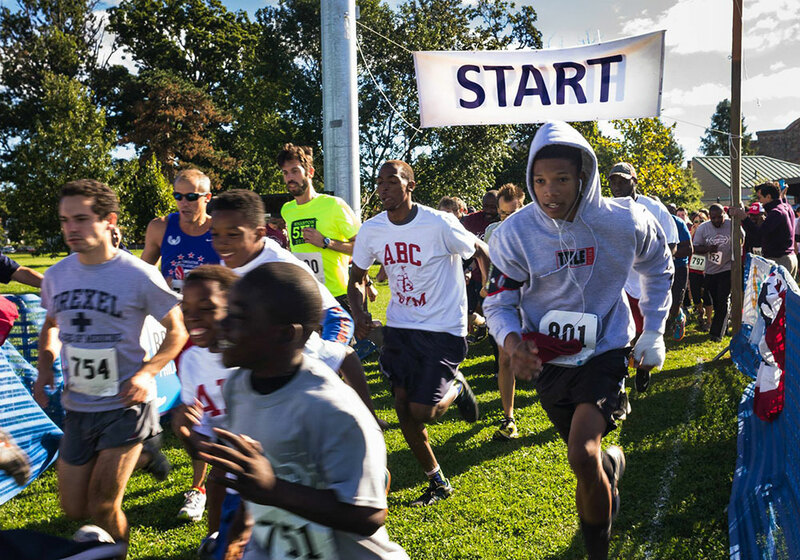 Annual events at the park include more than 60 regattas held on the Schuylkill; neighborhood festivals, including Jackie Robinson Day and Strawberry Mansion Day; and runs, including the Boxers’ Trail 5k, Belmont Plateau Hall of Fame Classic, and dozens of charity walks and runs. Cultural institutions and historic house museums in the park hold events such as concerts at the Mann Music Center for the Performing Arts and the Dell Music Center, holiday house tours at the Park Charms Houses, and the annual Cherry Blossom Festival at the Shofuso Japanese House & Garden.